BACKGROUND: This was our 9th cruise, 8th NCL Cruise - and our 5th ship in the fleet. Also, this was our 3rd Christmas cruise in a row. I do extensive research before we leave, and read TONS of reviews. I always join our CC roll call and any others I can find elsewhere on the Internet. This cruise I was the Cruise Critic Meet & Greet organizer, which I love doing. We traveled with 8 people total. I&apos;m almost 50, married and our 22 year old daughter was with us. HOTEL: We arrived very late into FLL on Friday night, so we decided to stay at an airport hotel to get some sleep. We stayed at the Fort Lauderdale/Hollywood Airport Holiday Inn. We were happy with everything about the hotel. Beautiful lobby, we had breakfast at Denny&apos;s across the street, nice rooms, great service. Our only piece of advice is for them to tighten up their logistics when it comes to their courtesy shuttle picking up folks at the airport. There were many people headed to the hotel, but it was very difficult to determine who had arrived at the curb first because there was no line. There were some raised voices and heated discussions among guests trying to figure out who had waited longer. Perhaps if the hotel gave out confirmation numbers or had a sign at the stop for folks to form a line, that would alleviate the stress. TRANSFERS: We decided to order an Uber/Lyft to take us to the Port of Miami from the hotel. I had been checking both apps and knew they were similarly priced. When we were ready to leave, I tried Uber, but there were none available, so I switched to Lyft. Within 2 minutes (literally) our driver arrived in a (surprise) Ford Explorer. Plenty of room for 3 of us and our 3 suit cases and 3 personal items. We were meeting our friends at the port. EMBARKATION: We arrived at the port at 10:30. Our luggage was pulled right from the car onto a cart, and we were through the terminal, security and check-in within 15 minutes start to finish. We stopped at the waiting area upstairs to meet our friends for our welcome-aboard photo (Matching t-shirts). We could have been on the ship before 11am! We ended up boarding before noon and watched many people breeze right through the waiting room on their way to boarding, too. SO smooth and easy. It is clear that they move lots of people in Miami. CABINS: We had two cabins - an inside cabin for my husband and I on Deck 11 within steps of the elevator. We LOVED the location. And the corridor was very quiet. Our room steward (Asha) was WONDERFUL. She took great care of us and kept our room well-supplied and looking great. She was always happy to see us and knew both our names every time. She was the best steward we have had in several cruises. We liked everything about our cabin with the exception of two storage issues: No drawers at all - storing socks, underwear and such was a pain! The other issue was the closet shelves faced sideways in the closet with no light in there. It was VERY difficult to stay organized and find items. On the other hand, the bathroom had more storage than we’ve ever seen! Our daughter was in a Studio cabin on Deck 11 and she loved it. We all wanted to take turns staying in there- laid out so nicely for one person. Well designed storage, plenty of plugs and charging ports, an oversized twin bed. Very nicely done and the virtual window was something she enjoyed. One downside for her was being able to hear sounds from surrounding cabins (snoring and puking, actually) even with her white noise machine on. It kind of bummed her out. MOBILE APP: We have paid for this app on 3 cruises. The first cruise we were very disappointed in it - we missed messages and it was unreliable. The second cruise we got it again because it was a big group of us and we knew we’d be on different schedules. The app had not improved much but we were better about opening our phones, opening the app and checking it more often. We never received alerts. 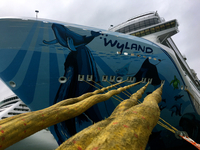 On this cruise, the app had a facelift and we loved it. We could send photos, and actually call each other (or call cabins) using the app. Notifications came up more easily and with the group text feature we were able to keep everyone in the loop about meeting times and places. We loved it. ACTIVITIES: We love an active cruise. We join games, attend trivia, and usually take advantage of special features on ships. We found the Bliss to be pretty similar to other ships - with Silas as our cruise director (we’ve had him before) everything was fun. So, even though I’m going to point out some negatives, our OVERALL experience was excellent. Please, please, please stop using the Atrium for activities on ships! The customer service desks struggle to provide good service, there aren’t enough seats and it is VERY hard to have adult programming if there are kids floating in and out (or staying even though their parents have been advised about content). Go-Karts need some logistic changes. We used the video screen to make our reservation. There are two of us in our cabin, but we reserved for 4 people. We showed up 10 minutes early, made it right to the front of the line, then they looked down at our Crocs and said we needed sneakers. Your website does NOT say sneakers. It says Covered Shoes. Crocs are covered shoes in the opinions of many. So, 3 out of 4 of us ran back to cabin to change. We arrive back 5 minutes late, and they open our reservation for 4. They only allow the two people who are assigned to that cabin to load. So 2 of us watched. From start to finish, the process was 1h45m. That’s a LONG time to invest on a cruise. A child who couldn’t drive broke down 3 times, slowing their race until the last 4 laps seemed pointless. Just overall disappointing. We could never get reservations for Laser Tag. That was sad. :( What happened to Quest?? We MISS IT!!! Such a fun adult game and guessing because it would have to be in the Atrium might be the reason why it didn’t happen. Actually - any “Adult” entertainment was limited because of the atrium. There are MANY PEOPLE who are FINE WITH ADULT CONTENT AND HUMOR!! If you label/warn it as such, then stop backing down to those who complain! They can attend a different event!! We like that break from the routine at home. POOL CHAIRS: THANK you for the new policy! A large video screen at the pool said not to reserve chairs for more than an hour. Unattended chairs will be cleared of belongings and owners can pick them up at Deck 6. YES!! We loved watching unattended chairs (usually well more than an hour) get cleared off so folks could actually get seats. It was a little tricky for us when we went to the Go Kart track (see above) for 1 hour and 40 minutes (it should NEVER take that long) so we had to send folks in our group down in shifts to sit in our chairs to make sure they weren’t cleared. But, if they had, we would have understood. Next??!!? NCL needs to do the same in the Observatory because people save seats up there as well. We saw a few arguments over chairs while we were up there. SERVICE: Even before boarding, the CruiseNext rep came over to us in the waiting area to make sure we were okay (everyone was boarding and we were waiting for friends). He chatted with us for a while, answering questions, featuring the ship. I saw him ALL OVER the Bliss talking to passengers. He was awesome and exemplified the service we received all week. The bartenders are all amazing. Friendly and funny and engaging and efficient. Servers at all meals were great. They were attentive and kind, happy and accommodating. They would remember us if they saw us different days. The Muffin Girls were terrific! The only downside for me I’ve noticed on several ships and feel more confident in sharing. I don’t like watching the “managers” on duty in the dining rooms (any of them, really). They seem intense and intimidating. It does NOT seem like they trust the professional experts working under them. I will say that any time we wanted to ask for something that was forgotten or mixed up, we didn’t do it because we could see how hard the servers were working (Especially with the new iPad ordering system!! ), so we didn’t want them to get in trouble. Anyways, in their zeal to make things “right” for the customers, those intense dining room managers are making it uneasy for all of us. Lighten up and Support Them instead of trying to catch them doing something wrong!! PORT & SHORE EXCURSIONS: We only went on one excursion - Best of St. Thomas. LOVED the twisty turny bus ride up to Mountain Top. View was awesome even though it rained. Magens Bay was gorgeous and we walked far away from the drop off point for our 2 hours. When we arrived back at the downtown area, we EASILY found where we were to catch our shuttle back to ship (Other reviews complain about this). Their written and verbal communication were very clear. However, it was Christmas and we didn’t want to wait - so we shared a taxi with another couple and 10 of us paid $4 each to drive back on our own. Not NCL’s fault, just our preference (Like I said time on a cruise ship is precious!!). Tortola we only explored the area right off the ship - cute shops, about 60 minutes spent there. Nassau we are not fans of, so we got off ship (there were FIVE SHIPS IN PORT!) and took some photos. DINING: Using the screens not ideal for groups to get reservations (we were 8 people, 4 cabins). Waiting in reservation line on Day 1 was a long time. Great service and they helped us with everything, but a LONG wait. . Food in all restaurants was delicious. We made reservations at Los Lobos for appetizers and it was awesome. I would do that again - wish they opened a bit earlier for people like us who only want apps. Buffet improvements since last cruises - love the high tables and it was MUCH cleaner. We are NOT fans of the buffet on any ship because of the noise and the mixture of smells. ENTERTAINMENT: We enjoyed the shows. We wondered why the theater was so small (no balcony?) but it did not affect our experience (well, except we like to exit down at the first row to get out and couldn’t). We loved them. We spent a few nights with Jim Badger and laughed the night away and sang at the top of our lungs. He was great. Enjoyed the Prohibition - the girls did a great job and the drinks were fine. They hung out and talked to audience members for quite some time after. It would be SO MUCH EASIER if one cabin could reserve multiple numbers (and enter cabin numbers for everyone!!) all in one fell swoop. MEET & GREET: I’ve been to a bunch and organized a bunch. This one was a bit different - we were given mimosas and passed appetizers. Crew members mingled with us. I was given a mic to say hi and used it for everyone to introduce themselves. After, we did a slot pull and then followed it up with a Bar Crawl. It was fun. Wish more participated (so many more RSVP’d) but we still had lots of fun and Bliss staff treated us so well. DISEMBARKATION: Because I organized the Cruise Critic meet & greet, I was granted Priority disembarkation. We were off the ship and at the curb within 15 minutes. So easy. Highly recommend. SUMMARY - Other reviews frustrate me. Their reviews talk about only one pool.? There are two main pools (one with no kids) plus a splash area for kids and a grotto area in H2O. This was a Christmas cruise - so yes, more kids. But this year was fewer kids than last two years and we had a greater chance of finding space on our own without them on this ship if we wanted to. Decorations were fine - many trees (not just a few!!) and it was the PASSENGERS who dressed up and decorated their doors who upped the Christmas Spirit. We only encountered ONE staff member who was less than awesome. And yes, she was miserable (bartender). But the others we met were so good to us. Even with my critiques, this was my favorite ship, and we had a great cruise. You might find me stowed away on the Waterfront if you go check right now…. Mojito, anyone?? 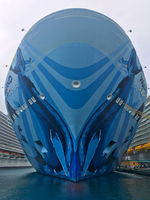 This was our 9th cruise, 8th NCL Cruise - and our 5th ship in the fleet. Also, this was our 3rd Christmas cruise in a row. I do extensive research before we leave, and read TONS of reviews. I always join our CC roll call and any others I can find elsewhere on the Internet. This cruise I was the Cruise Critic Meet & Greet organizer, which I love doing. We traveled with 8 people total. I&apos;m almost 50, married and our 22 year old daughter was with us. We arrived very late into FLL on Friday night, so we decided to stay at an airport hotel to get some sleep. We stayed at the Fort Lauderdale/Hollywood Airport Holiday Inn. We were happy with everything about the hotel. Beautiful lobby, we had breakfast at Denny&apos;s across the street, nice rooms, great service. Our only piece of advice is for them to tighten up their logistics when it comes to their courtesy shuttle picking up folks at the airport. There were many people headed to the hotel, but it was very difficult to determine who had arrived at the curb first because there was no line. There were some raised voices and heated discussions among guests trying to figure out who had waited longer. Perhaps if the hotel gave out confirmation numbers or had a sign at the stop for folks to form a line, that would alleviate the stress. We decided to order an Uber/Lyft to take us to the Port of Miami from the hotel. I had been checking both apps and knew they were similarly priced. When we were ready to leave, I tried Uber, but there were none available, so I switched to Lyft. Within 2 minutes (literally) our driver arrived in a (surprise) Ford Explorer. Plenty of room for 3 of us and our 3 suit cases and 3 personal items. We were meeting our friends at the port. We arrived at the port at 10:30. Our luggage was pulled right from the car onto a cart, and we were through the terminal, security and check-in within 15 minutes start to finish. We stopped at the waiting area upstairs to meet our friends for our welcome-aboard photo (Matching t-shirts). We could have been on the ship before 11am! We ended up boarding before noon and watched many people breeze right through the waiting room on their way to boarding, too. SO smooth and easy. It is clear that they move lots of people in Miami. We had two cabins - an inside cabin for my husband and I on Deck 11 within steps of the elevator. We LOVED the location. And the corridor was very quiet. Our room steward (Asha) was WONDERFUL. She took great care of us and kept our room well-supplied and looking great. She was always happy to see us and knew both our names every time. She was the best steward we have had in several cruises. We liked everything about our cabin with the exception of two storage issues: No drawers at all - storing socks, underwear and such was a pain! The other issue was the closet shelves faced sideways in the closet with no light in there. It was VERY difficult to stay organized and find items. On the other hand, the bathroom had more storage than we’ve ever seen! Our daughter was in a Studio cabin on Deck 11 and she loved it. We all wanted to take turns staying in there- laid out so nicely for one person. Well designed storage, plenty of plugs and charging ports, an oversized twin bed. Very nicely done and the virtual window was something she enjoyed. One downside for her was being able to hear sounds from surrounding cabins (snoring and puking, actually) even with her white noise machine on. It kind of bummed her out. We have paid for this app on 3 cruises. The first cruise we were very disappointed in it - we missed messages and it was unreliable. The second cruise we got it again because it was a big group of us and we knew we’d be on different schedules. The app had not improved much but we were better about opening our phones, opening the app and checking it more often. We never received alerts. On this cruise, the app had a facelift and we loved it. We could send photos, and actually call each other (or call cabins) using the app. Notifications came up more easily and with the group text feature we were able to keep everyone in the loop about meeting times and places. We loved it. ACTIVITIES: We love an active cruise. We join games, attend trivia, and usually take advantage of special features on ships. We found the Bliss to be pretty similar to other ships - with Silas as our cruise director (we’ve had him before) everything was fun. So, even though I’m going to point out some negatives, our OVERALL experience was excellent. Please, please, please stop using the Atrium for activities on ships! The customer service desks struggle to provide good service, there aren’t enough seats and it is VERY hard to have adult programming if there are kids floating in and out (or staying even though their parents have been advised about content). Go-Karts need some logistic changes. We used the video screen to make our reservation. There are two of us in our cabin, but we reserved for 4 people. We showed up 10 minutes early, made it right to the front of the line, then they looked down at our Crocs and said we needed sneakers. Your website does NOT say sneakers. It says Covered Shoes. Crocs are covered shoes in the opinions of many. So, 3 out of 4 of us ran back to cabin to change. We arrive back 5 minutes late, and they open our reservation for 4. They only allow the two people who are assigned to that cabin to load. So 2 of us watched. From start to finish, the process was 1h45m. That’s a LONG time to invest on a cruise. A child who couldn’t drive broke down 3 times, slowing their race until the last 4 laps seemed pointless. Just overall disappointing. What happened to Quest?? We MISS IT!!! Such a fun adult game and guessing because it would have to be in the Atrium might be the reason why it didn’t happen. Actually - any “Adult” entertainment was limited because of the atrium. There are MANY PEOPLE who are FINE WITH ADULT CONTENT AND HUMOR!! If you label/warn it as such, then stop backing down to those who complain! They can attend a different event!! We like that break from the routine at home. THANK you for the new policy! A large video screen at the pool said not to reserve chairs for more than an hour. Unattended chairs will be cleared of belongings and owners can pick them up at Deck 6. YES!! We loved watching unattended chairs (usually well more than an hour) get cleared off so folks could actually get seats. It was a little tricky for us when we went to the Go Kart track (see above) for 1 hour and 40 minutes (it should NEVER take that long) so we had to send folks in our group down in shifts to sit in our chairs to make sure they weren’t cleared. But, if they had, we would have understood. Next??!!? NCL needs to do the same in the Observatory because people save seats up there as well. We saw a few arguments over chairs while we were up there. SERVICE: Even before boarding, the CruiseNext rep came over to us in the waiting area to make sure we were okay (everyone was boarding and we were waiting for friends). He chatted with us for a while, answering questions, featuring the ship. I saw him ALL OVER the Bliss talking to passengers. He was awesome and exemplified the service we received all week. The bartenders are all amazing. Friendly and funny and engaging and efficient. Servers at all meals were great. They were attentive and kind, happy and accommodating. They would remember us if they saw us different days. The Muffin Girls were terrific! The only downside for me I’ve noticed on several ships and feel more confident in sharing. I don’t like watching the “managers” on duty in the dining rooms (any of them, really). They seem intense and intimidating. It does NOT seem like they trust the professional experts working under them. I will say that any time we wanted to ask for something that was forgotten or mixed up, we didn’t do it because we could see how hard the servers were working (Especially with the new iPad ordering system!! ), so we didn’t want them to get in trouble. Anyways, in their zeal to make things “right” for the customers, those intense dining room managers are making it uneasy for all of us. Lighten up and Support Them instead of trying to catch them doing something wrong!! 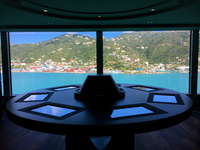 PORT & SHORE EXCURSIONS: We only went on one excursion - Best of St. Thomas. LOVED the twisty turny bus ride up to Mountain Top. View was awesome even though it rained. Magens Bay was gorgeous and we walked far away from the drop off point for our 2 hours. When we arrived back at the downtown area, we EASILY found where we were to catch our shuttle back to ship (Other reviews complain about this). Their written and verbal communication were very clear. However, it was Christmas and we didn’t want to wait - so we shared a taxi with another couple and 10 of us paid $4 each to drive back on our own. Not NCL’s fault, just our preference (Like I said time on a cruise ship is precious!!). Tortola we only explored the area right off the ship - cute shops, about 60 minutes spent there. Nassau we are not fans of, so we got off ship (there were FIVE SHIPS IN PORT!) and took some photos. DINING: Using the screens not ideal for groups to get reservations (we were 8 people, 4 cabins). Waiting in reservation line on Day 1 was a long time. Great service and they helped us with everything, but a LONG wait. . Food in all restaurants was delicious. We made reservations at Los Lobos for appetizers and it was awesome. I would do that again - wish they opened a bit earlier for people like us who only want apps. Buffet improvements since last cruises - love the high tables and it was MUCH cleaner. We are NOT fans of the buffet on any ship because of the noise and the mixture of smells. ENTERTAINMENT: We enjoyed the shows. We wondered why the theater was so small (no balcony?) but it did not affect our experience (well, except we like to exit down at the first row to get out and couldn’t). We loved them. We spent a few nights with Jim Badger and laughed the night away and sang at the top of our lungs. He was great. Enjoyed the Prohibition - the girls did a great job and the drinks were fine. They hung out and talked to audience members for quite some time after. It would be SO MUCH EASIER if one cabin could reserve multiple numbers (and enter cabin numbers for everyone!!) all in one fell swoop. I’ve been to a bunch and organized a bunch. This one was a bit different - we were given mimosas and passed appetizers. Crew members mingled with us. I was given a mic to say hi and used it for everyone to introduce themselves. After, we did a slot pull and then followed it up with a Bar Crawl. It was fun. Wish more participated (so many more RSVP’d) but we still had lots of fun and Bliss staff treated us so well. DISEMBARKATION: Because I organized the Cruise Critic meet & greet, I was granted Priority disembarkation. We were off the ship and at the curb within 15 minutes. So easy. Highly recommend. SUMMARY - Other reviews frustrate me. Their reviews talk about only one pool.? There are two main pools (one with no kids) plus a splash area for kids and a grotto area in H2O. This was a Christmas cruise - so yes, more kids. But this year was fewer kids than last two years and we had a greater chance of finding space on our own without them on this ship if we wanted to. Decorations were fine - many trees (not just a few!!) and it was the PASSENGERS who dressed up and decorated their doors who upped the Christmas Spirit. We only encountered ONE staff member who was less than awesome. And yes, she was miserable (bartender). But the others we met were so good to us. Even with my critiques, this was my favorite ship, and we had a great cruise. You might find me stowed away on the Waterfront if you go check right now…. Mojito, anyone?? We love Miami. We had friends pick us up and take us to see the Everglades via airboat. A great day, followed by dinner in Ft. Lauderdale before we headed to airport. We are not Nassau fans. We don&apos;t feel safe there. We got off ship and made it to the gate. Saw the mayhem outside the gates b/c there were 5 ships in harbor and then turned around, walked back to the Bliss and re-boarded. 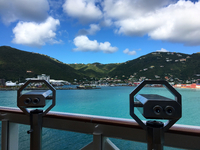 NCL: Best of St. Thomas tour. We paid (I think) $60/ person? We took an open-air bus to Mountain Top (VERY fun, lol!) where we had 25 minutes to shop and snap photos. We then headed to Magens Bay where we had 2 hours to enjoy the beach. We were dropped off downtown where we could shop before returning to our ship. We liked the trip, but would have enjoyed more historical commentary on the bus. The sound system made it VERY hard to hear/understand. Other reviews critiqued the means to get folks back to the ship, but the tour operator was very clear in their communication (verbal and written) to us on where to catch our water shuttle back to the Bliss. We just got off the ship for about an hour and did a little shopping in the immediate port. The views from the ship were stunning. Beautiful ship, with lots of activities. NCL got it right with the Bliss!